Colorado Mountain Living! 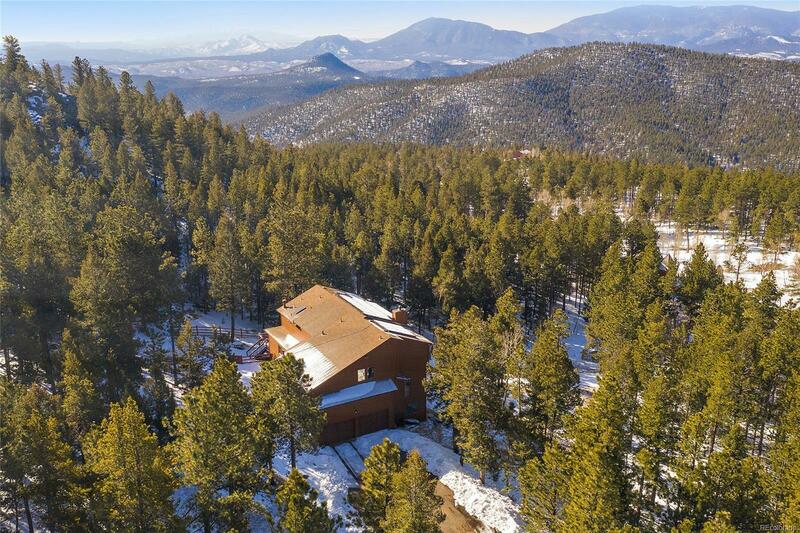 8 beautiful acres drenched in sunlight with sweeping mountain views. Open with 2-story windows and a soaring tongue & groove ceiling. Spacious main floor living offers an open kitchen, great room with a wood burning stove and copper patina surround, separate family room with a barn door for privacy, formal dining and a 2nd master suite. The upper level loft/library overlooks the great room and offers amazing views. Upper level has 2 additional bedrooms and bath plus a spacious master suite with a private deck. The walkout lower level has endless possibilities and is home to a huge game/family room, bedroom and office. Sun Edison Solar System, Newer boiler and roof was replaced in 2014. Just minutes to Hwy 285 and local shopping.